The final work on this disc is the Sonata No. 5 of 1992, which was composed for the present pianist’s sixtieth birthday. It starts slowly, but gradually builds up in intensity. Its second movement is marked by its diverse primary and secondary thematic material and the dissonance that runs through it (and, indeed, much of Dodson’s piano music). The third movement is the closest that the composer comes to writing a true slow movement, with its slow progression and development heightening the intensity through the strength which which the keys are played rather than in tempo. In contrast the final movement begins with a real flourish before rushing headlong to the works conclusion. I have always found Bernard Roberts to be a most underrated pianist; at home in classical, romantic and modern repertoire, he shows a real skill in interpreting what ever he plays. His recording of the Complete Beethoven Sonatas for Nimbus (NI 1774) is particularly fine as is his disc of the variations (NI 1785), but it his recordings of twentieth century music, especially his Herbert Howells (SRCD 292) and Hindemith (NI 5459/60) which I return to most often. This disc once again shows his mastery of the modern idiom, but then he did give the premiere performances of sonatas Nos. 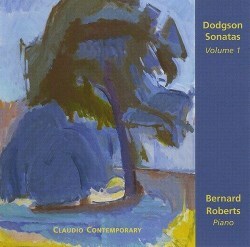 3 to 6, so he should know the works, especially with Dodgson having composed some of the sonatas with Roberts in mind. His playing is excellent throughout especially in the way that he can articulate the differing passages and intensities within a single movement; he is captured in a sympathetic and natural acoustic. A worthy investment for anyone interested in twentieth century piano music in general and the music of Stephen Dodgson in particular.